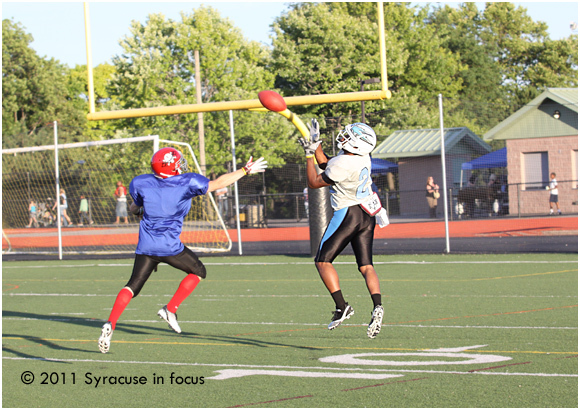 The Syracuse Shock Football Club, last year’s NAFL’s Eastern champs, began their season on Saturday by bullying the Elmira Evolution 76-19 at Henninger Field. This year the Shock joined the Empire Football League, which has teams in Albany, Watertown, Plattsburgh, Glens Falls, Vermont, and Montreal. Kicker Zach Grulich made 10 of 11 PATs. This entry was posted on Monday, July 11th, 2011 at 11:22 pm and is filed under Sports. You can follow any responses to this entry through the RSS 2.0 feed. You can leave a response, or trackback from your own site.